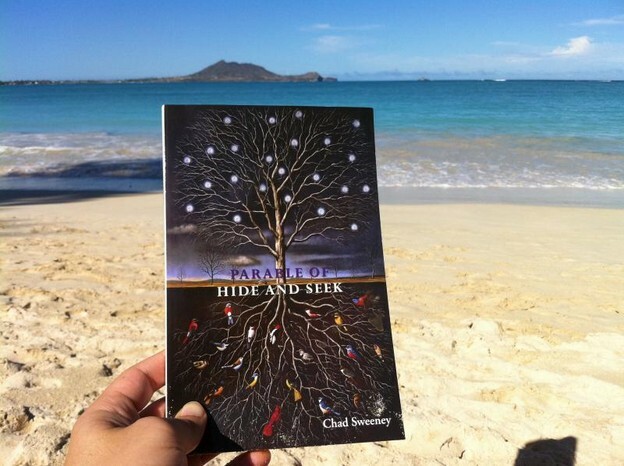 On my beachshelf for 2011 is Chad Sweeney's Parable of Hide and Seek (Alice James, 2010). Being a kind and generous poet, Chad agreed to answer a few questions about his work. I'm happy to share his very poetic answers with you. Chad Sweeney is a poet and translator. He is the author of three books of poetry: Parable of Hide and Seek (Alice James, 2010), Arranging the Blaze (Anhinga, 2009), and An Architecture (BlazeVox, 2007); translator (from the Persian, with Mojdeh Marashi) of The Selected Poems of H.E. Sayeh:The Art of Stepping Through Time (White Pine, 2011); and editor of the anthology Days I Moved Through Ordinary Sounds: the Teachers of WritersCorps in Poetry and Prose (CityLights, 2009). His fourth book of poems, the bilingual (English/Spanish) Wolf Milk: Lost Poems of Juan Sweeney will be published next year by Forklift Books. He taught poetry and literature for fifteen years in San Francisco, while earning an MFA from San Francisco State University, before moving to Kalamazoo, Michigan to pursue a Ph.D. at Western Michigan University where he teaches poetry and serves as assistant editor of New Issues Press. In the fall, Chad will join the faculty as assistant professor in the new MFA program at California State University, San Bernardino. I was immediately struck by the title of your new collection: Parable of Hide and Seek. How did you arrive at this title? Well, it felt right for the book, intuitively, the tones of play and seriousness, of story-telling, koan, and childlike wonder, but the more I considered it deeply the more thematic significance it offered up. The title, as well as the poem by that name, imagine the universe playing hide and seek with itself, expressing and obscuring, birthing and dying, at the “thing” level as well as the molecular level, with time as playground. There is a hide-and-seek of signification as well—language as a game of bordering, of grouping and illusion—language as a sense, the sixth or the first, experienced individually in the nation-of-one, but also collectively where Self is plural; this language sense both invents and binds a world. I don't believe that we can “cleanse the doors of perception” without inviting a wind to blow hard into language and to set the hinges swinging and singing in the key-of-no-key. It’s possible to say that reader and writer play hide and seek with one another, as do wolves and deer, sunlight and grass, sign and signified, hurricanes and houses. The sense of play, wonder, and mystery are definitely present throughout the book—a tone that keeps me engaged. And I love the idea of a “hide-and-seek” of signification, of hide and seek between reader and writing. That's captured nicely in the final couplet of the title poem: “You were my partner in everything. / I lived for you to find me.” Speaking of hide and seek, there are many cities in your book, both general and specific, in which the speaker moves through. What is your relationship, as a poet, to cities? Early on in my writing life, I could only become inspired by nature, in communication or communion with the sublime of mountain and tamarack, mesa and saguaro, or the sea flowering around rocks. But I wanted that same sense of wonder to occupy the cities where so many of us live. I wanted a Nature poetry of the City, with its own grammar, vocabulary and attitudes. One that could touch streets and glass and powerlines with a sense of awe and bewilderment. I’ve also come to understand that I think outside myself, and that I need interesting spaces to think into. Cities provide those spaces, San Francisco with its hills, architectures, parks and bridges, a dynamic interplay of foreground and distance in a single frame—and New York’s astonishing vertical geometries, passageways of space issuing straight up between buildings, and the fractured sky that comes all the way down to be shaped inversely against it. Likewise, I’ve come to know the city as locus of the collective self—with all its grief, love, exile and possibility—a living vertical library and repository of the dazzling moment with all its tributary moments, an intertext of voices, faces and forms, where each city is haunted uniquely by sunlight and by history. There are a few moments in your book when you explore writing/poetry/language itself: "For me speech is / a way of touching"; "the oblique syntax of bones / repeats its inquiry / in the language of the world"; "The sentences were thinking / inside me, / filling my hands with rain". All these instances feel embodied, so I'm wondering if you can talk about your relationship to (and/or the relationship between) language and the body. I haven’t verbalized this yet, but I’ll take a shot at describing what I think is happening. I’ve begun to experience “mental” processes in an increasingly physical way. Language in this context is part force and part structure, wave and particle. So I’ve been writing lines that imagine language as muscular or structural, stuff like: “I think towards her;” “I rent this language to stay dry in,” “I feel a thought forming, a red thought lit from beneath,” and “a noun is verbing.” Language happens in the body, yes, but also beyond the body and before the body. It is unclear whether we thinks language or language thinks we. Buddhism celebrates the breath as a threshold of contact, that revolving door of air that opens and opens to remind us of the interbeing of self and world, as the world literally enters us through our inhale, and we enter the world through our exhale. Language is like that. Inseparable from the ground of consciousness and the objects of our perception which remake us hourly. “The limits of my language mean the limits of my world,” and so forth. Through language the mountains enter us, and the distances of history and math. Language is the body beyond the body, the shared body, in which the individual is plural, “I speak therefore I are.” On one level I understand these things, or intuit them, but I have to write them into being as an act of faith. Speaking of inhale and exhale, there are many dichotomies explored in your work: day and night, keys and locks, hide and seek, man and woman, language and silence, self and world, the real and the surreal. In the poem "Parable of Night," we read: "This story is bound in frames"--perhaps referencing both narrative frames and framing dichotomies. What role do you think poetry has in interpreting, questioning, mapping, and--sometimes--breaking through such frames? That's a tricky question. I think poetry thrives in that twilight between dichotomies, that violet suspension of time between afternoon and night, or between conscious and unconscious, or self and other. Our belief in dichotomies and categories forms binding habits, a deadening of the senses—we all know this—and one of poetry’s powers is to shake us out of these habits, to “make strange.” One way I’ve tried to enact the ritual of freedom is by establishing the frames in a state of fixity, only to break them again, in a game of prison-break or hide and seek. To set up the poles as false idols, and then to disappear into transformative and sovereign regions between. Or elsewhere. In the ultimate dimension the nature of Being is flux, formless, processual, where all “things” are only images on the surface of a shimmering curtain. Yet we must live, and we live in time, inside our names and inside our stories, “bound in frames.” One way poetry serves us is by celebrating both Life and Void, by moving back and forth between the framed and the unframable, between the named and the nameless, form and formlessness, or in Nietzschean terms, the Apollonian and Dionysian. Poems are often balanced on this fulcrum where elegy and celebration are synonyms. This is a coyote’s canyon, a crow’s sky underground. This kind of poem is a bounded infinity. Sometimes the rhetoric of a poem says “Life” while the image and syntax say “Void.” This rift is generative. There are many ways to fix and simultaneously dissolve the frame. Even the line of poetry is a frame—the stanza, the sentence, the word, the language, all serve as frames within frames, yet the music that flows through them overspills the frames and expands beyond the visible boundaries of the poem. I counted four prose poems in your new book. Because they each have the same haunting tone and unpredictable narratives as the poems in free verse, I am wondering how they became prose poems? What are your thoughts on the difference in the form? How do they speak to the free verse poems? One thing I enjoy about a prose poem—especially when it appears suddenly in the midst of free verse like some strange animal in one’s living room—is that its words are brought closer together into a dense matrix, a honeycomb, so that the eye, in reading a given line, records what’s above and below, as echoes or premonitions, the consciousness thickening toward an inward sensorium. The words, tossing their little halos about, their golden hooves, interact with one another more unpredictably. Likewise, a given word is no longer privileged for its position on the line, as first or last, nor is it allowed a safe distance from its neighbors. The energy is everywhere, spread across a charged field. The words are afforded equal weight, yet are not equal—they chirp and jostle and demure by their own nature—they congress and prison riot to form a sonic tapestry and visual rhythm. For example, in Canton Central Market I stared down into a box of scorpions. The scorpions were meant to be eaten. They looked deadly and delicious. They slid over one another, alive, armored in ambers and scarlets. During his tenure as the “Last Commentor in Paradise” Craig Santos Perez will write about issues of representation, displacement, witness, and resistance. He will also post intereviews with authors currently on his beachshelf. You should friend him on Facebook, where he posts daily on the power of poetry to inspire, heal, beautify, and enrich. Craig Santos Perez, a native Chamoru from the Pacific Island of Guahan (Guam), is the co-founder of Achiote Press and Ala Press and the author of two poetry books: from unincorporated territory [hacha] (Tinfish Press, 2008) and from unincorporated territory [saina] (Omnidawn Publishing, 2010), recently noted as a finalist for the 2011 Los Angeles Times Book Prize in Poetry. He is an Assistant Professor of Creative Writing in the English Department at the University of Hawai'i, Manoa. Baloney Hoagie wrote a letter to me!